Stridor is a result of turbulent air-flow through the trachea from upper airway obstruction, and although in children it is often due to croup, it can also be caused by noninfectious and/or congenital conditions as well as life-threatening etiologies. 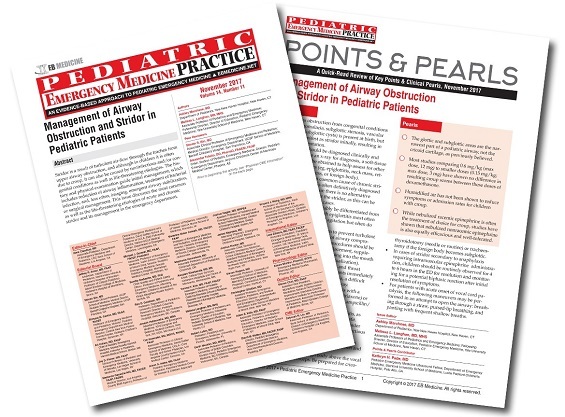 The history and physical examination guide initial management, which includes reduction of airway inflammation, treatment of bacterial infection, and, less often, imaging, emergent airway stabilization, or surgical management. 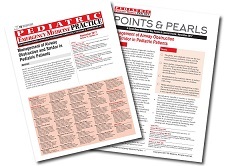 This issue discusses the most common as well as the life-threatening etiologies of acute and chronic stridor and its management in the emergency department. A 20-month-old boy is brought into the ED by his mother who is concerned because he woke up with a barky cough and he sounded like he was having difficulty breathing. Prior to tonight, he had 2 days of fever and a runny nose. The mother states that her son's voice sounds more hoarse than usual. The boy’s vital signs are notable for a fever of 39.2°C (102.6°F), a respiratory rate of 60 breaths/min, and a pulse oximetry reading of 98% on room air. He is not in significant acute distress when you walk into the room, but you immediately notice inspiratory stridor at rest, and subcostal retractions. The physical examination is otherwise notable for clear rhinorrhea and transmitted upper airway sounds in the lungs. The nurse asks if you would like to order urgent medications or imaging. Do you give racemic epinephrine and/or dexamethasone immediately? Is a chest x-ray necessary? How long should you observe this patient before deciding on his disposition? A few minutes later, EMS brings in a 4-year-old boy for stridor and drooling. Per the paramedics' report, he’s had 6 days of rhinorrhea and cough, followed by fever for the past 2 days. Tonight, his mother called 911 when he started drooling at the dinner table and would not participate in the family’s conversation. On EMS arrival, he is febrile to 40°C (104°F), his respiratory rate is 44 breaths/min, and he has a pulse oximetry reading of 92% on room air. The EMS team started supplemental oxygen via facemask and attempted to place a peripheral IV catheter, without success. On ED arrival, the boy is sitting up on the stretcher, unwilling to move. You ask him his name, but he just looks at you and doesn’t answer. The collar of his shirt is wet from drooling, and he looks afraid. At this point, what initial steps should be taken? Should you make another attempt to obtain IV access? Is imaging necessary?